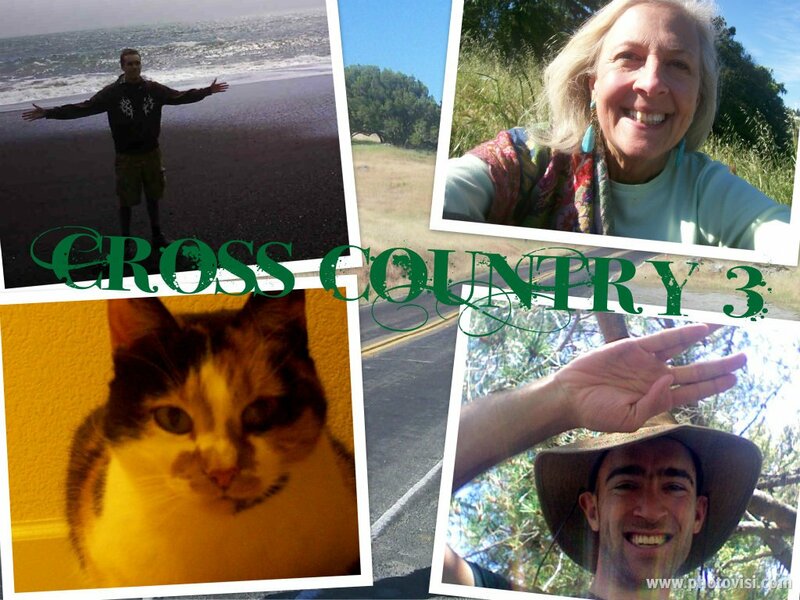 Meant to post this yesterday, but instead it can be a “flashback friday” … Five years ago today I was nearing the end of my Cross Country 3 journey. I took time to chronicle the experience in detail using the Facebook Notes app (remember that?) and didn’t post it here, though I could have. So it’s worth another look today. My first cross country journey spanned from late September to late October, 2006, traveling for half of the time with my college friend Russ and half the time on my own seeing friends and the sights. This trip was a 7000 mile loop from Waltham, MA to Waltham, MA, via California, Washington, Oregon, Idaho, Utah, Wyoming, Colorado, Nebraska, Iowa, Illinois, Indiana, Michigan, Ohio, New York, Connecticut, and Massachusetts. The journey, for me, was at its essence about recognizing the vast expanse of America, and seeing my own potential for growth and change in my then-new post college life. A little over a year later, I journeyed across the country again, this time going from Beverly, MA, to Santa Maria, CA, and traveling with my mom and my cat, KC. This route took us through Massachusetts, Connecticut, New York, New Jersey, Delaware, Maryland, Virginia, North Carolina, South Carolina, Georgia, Alabama, Mississippi, Louisiana, Texas, New Mexico, Arizona, and California. We kept a steady pace on this trip, where I had to be in Santa Maria by a certain date in January to start a new theatre position. Perhaps for that reason, this journey feels more blurry in memory than my first trip. With the possible exception of New Orleans, where we celebrated New Year’s Eve 2007 into 2008, most of the stops made me feel like “this is really great, and I wish I had more time to see the place or the surrounding area!” Nonetheless, the feeling of empowerment and potential swung in to action on this journey, where I wasn’t just seeing the possibility of change and new direction… I was actually living it, by speeding away from my lifelong Northeastern home base into a new self-directed reality in California. At some point in early 2011, it became apparent that I might have an opportunity to embark on another Cross Country journey over the summer. The “Northern Route” had been in the back of my mind as an ideal way to return to the Northeast ever since I moved to the West Coast. I enthusiastically hand wrote a potential route to travel: California, Oregon, Washington, Idaho, Montana, Wyoming, South Dakota, North Dakota, Minnesota, Wisconsin, Michigan, Ohio, Pennsylvania, Delaware, New Jersey, New York, Connecticut, and Massachusetts. I was hesitant to commit to the idea as it would mean closing up my comfortable and rewarding Bay Area life for the foreseeable future. I decided that I would give the Bay Area a deadline – which became June 15 – for a new job to appear. If that did not happen, I would move back to the Northeast for new opportunities, reconnecting with friends and family, and a fresh start. I wanted to make the possibility of staying in California work out, at least for a little while longer until the end of 2011. But the poor job market and lack of specific performing arts related opportunities soon made it clear that I would be leaving at the end of July. I grew to accept the reality of this choice, while not being shy of making the most of Bay Area Life in the remaining months. Looking back over those last few months makes me feel quite accomplished and proud, from the Mojave Desert vision quest to my Self Revelatory Performance to many memorable theatre performances to meaningful and memorable moments with local friends. Those last few weeks brought a surprising and admirable unity to my Bay Area life. Until July (or maybe June), I’d often felt perturbed by my floating amongst so many different worlds in the region. It felt like it reached a Zen level of balance between various social groups (Theatre, CIIS, Marin, Buddhism, etc) and my involvement and intermingling with all those strands. Nonetheless, I knew that it would all be coming to an end on July 25. There was poignancy in that knowledge, and surprisingly not too much sadness – at least for me. Meanwhile, my mom made arrangements to again travel with KC and I for 2/3 of the driving journey, and a college friend, Nate, became available to travel for a partially overlapping 1/3 of the trip. I didn’t realize until later on that we would be traveling in separate vehicles, in an arrangement that worked far better than I envisioned. The specificity of our travel plans and needing to be in certain places at certain times (Hiking and exploration in Montana, a theatrical premiere in Michigan, etc) allowed me to plan the journey with several layover days. In this way, we would not be constantly on the road. In a three week period, only four nights would be at hotels, thanks to the kindness of friends in nearly all of our/my destination points. The stage was set for a memorable adventure. This time, the travel journey brought the most rewards and memorable experiences yet of my three cross country adventures. I am sure this was due to the highly social nature of the trip. I was greeted by friends in almost every location, only three segments of the drive were ones I had driven before (not counting the Northeast Corridor), and I made a strong effort to document the journey on camera and in writing. I noticed the poignancy, intensity and presence of dropping in on friends for a few days and then moving on, while knowing that their lives will continue in their respective locations. It feels like this retrospective may be best captured through a day by day narrative, so I will continue in that mode. We left Marin County three hours behind schedule, and it was as if some part of me did not want to leave. I took a long time to gather all my Little Things in San Rafael, everything seemed to take longer than I expected, and my mom was Very Specific about how she wanted the car to be packed to ensure maximum visibility. I nearly drove away with my apartment keys in my pocket, and had to circle back to downtown San Rafael from Terra Linda to return them. My mood veered sharply from a wistful sadness at the start of the day to a more optimistic spirit of adventure as we proceeded north along US 101. The traffic was light as we moved out of Marin and into Sonoma County. I found it hard to believe that I had driven the 50 miles north to Healdsburg just one week before for a Birthday driving adventure. Mendocino County brought even less traffic, except in Willits, and an increased sense of space and place. I had forgotten that route 101 extends for over 100 miles through Mendocino, a much larger distance than several US states. We stopped briefly at the Gomde Meditation Center in Leggett, summer home of Chokyi Nyima Rinpoche. Humboldt County brought mammoth trees and a record number of hitchhikers. It was only my second visit there. My mom seemed to latch on to the generalization of the area being a Pot Haven and thought that many people we saw might be pot smokers. This was particularly apparent in Arcata, which became our dinner stop. She felt like she’d time warped back into the 1960’s as we sat at a SoCal-eque yogurt shop watching the just returned Humboldt State students enjoy being back in town. Many dreadlocked peace loving individuals happily co-existed alongside them as the sun set over the bay. I should add that this stop also began the custom of bringing KC in with us to cafes or stops as much as possible. I was not comfortable leaving her in the car, for health and security reasons. Therefore, we created a long running social experiment bringing her with us (staying in her carrier) into cafes, at least one restaurant, and a few gas stations. Some people noticed, and some people did not! I took the wheel of the Outback for the first time on the trip heading out of Arcata. I did not anticipate the dense, murky and amorphous fog that we would encounter between there and Crescent City. Route 101 winds along the scenic coast for the remaining 100 miles or so of California, but at night, this can lead to a treacherous mix of fog and curves. I stayed calm and slow speed as we continued north, and willingly pressed ahead at Crescent City after a brief pause. Oregon welcomed us with its name painted on to the road like a speed limit. Not too long later, we arrived in the coastal hamlet of Gold Beach. It was at least 11:00pm, four hours behind schedule, but we were there, and that was what mattered. I was impressed with this inn’s attention to detail in their clean rooms and willingness to be pet friendly. As they were right by the water, a persistent Pacific breeze was a welcome aroma while settling in for the night. The late arrival from Monday night meant that we were not able to see a sangha friend in Eugene, so I had to call him to explain early in the morning. He understood, and the slight disappointment did not put a damper on the day’s itinerary. As we wandered down to the Pacific Ocean, I realized that visit would be the last time I’d see the Pacific for a while. It was characteristically exuberant. A large pile of driftwood was propped up on the beach. My mom encouraged me to grab a piece of the wood and pose for a photo designed to emulate a similar shot of me with driftwood on Martha’s Vineyard around 1991. We had to excavate KC from her most extreme hiding place of the trip: under a bureau in the hotel room that also had the television and mini-bar attached to it. I managed to grab her without incident and she wore a slightly guilty expression for the first half of the day. I’d arranged for that day’s drive to be a mix of coastal and interior Oregon scenes. I felt like we didn’t have much momentum as we made several stops and starts on the coast in places like Bandon, Coos Bay and Florence. The scenery made up for any ill will, with many views reminiscent of Maine back in New England, although with a distinct Pacific flair. I was grateful to see more of the Oregon coast, having made a visit to the Northwestern corner of it in 2006. However, there is still 150 miles or so between Florence and Seaside that will have to wait for another time. The trek inland from Florence to Eugene brought heavy forest and the trees that Oregon is known for. Eugene’s ARCO station offered one of the lowest gas prices of the trip ($3.59) and a sudden, awkward reminder that Oregon has mandatory full service. I made the same mistake again at a Shell station the next day in Portland. We continued up Interstate 5 and reached Portland before dark. This was one of only two destination points on the trip where I had previously visited – the other was Ann Arbor, Michigan. In Portland’s case, the circumstance felt particularly unique. In showing my mom a place that I had already gotten to know on a personal level, I felt like I was turning up the curtain on a personal experience, and modifying it into a shared family experience. She seemed impressed with my familiarity with the city as we proceeded to the Belmont district. Our sangha friend Bettina offered warm hospitality and spontaneity over the next 36 hours. She has a comfortable house right in the heart of Belmont, and I particularly enjoyed sampling several restaurants along Belmont and Hawthorne Boulevards. I had previously come to know local favorites such as The Black Cow, Stumptown and Utopia Café. This time, the destinations included two Thai restaurants, the Cricket Café and a new French eatery. It was so refreshing to not get on the road that morning! I had no idea how nice it would feel to take some extra time in various locations, and am sure this contributed to Portland, Whitefish and Ann Arbor (which had all the “layovers” of the journey) becoming highlights of the trip. This day mixed social and personal activities to a T. We made our way to a shopping area near Portland Airport for some tax-free shopping. I remembered that the PDX airport had some personal significance. In 2006, I flew from there to Massachusetts, arriving on what became my final evening in the house I grew up in on Singing Beach in Manchester. I’d scheduled back to back social adventures for that afternoon, and was happy to move right on to a reunion with college friend and native Portlander Colin. We channeled the classy style of many previous adventures in finding a place to enjoy Happy Hour, and continued the saga joining up with my mom and her friend Ann for a leisurely Thai dinner. KC, my mom and I all bounded back into the car for an early start to what would be our longest distance travel day. Much later in the trip, I surpassed the distance traveling from Dayton, Ohio to Wilmington, Delaware – but I was not thinking about that on this date. I knew that the initial segment towards Montana would bring a repeat journey along the western Interstate 84, which parallels the Columbia River Gorge between Oregon and Washington. I’d taken care to document this scenery in 2006 while traveling with Russ; however, my camera was sadly stolen at the end of that trip. This time, I wanted to be extra sure to capture the gorge on camera and enjoy the experience. We had time and the sun on our side setting out so early in the morning. I decided to take the wheel for this stretch, where I was familiar with it and wanted to give my mom the pleasure of seeing the sights and choosing what to get pictures of. The Gorge is both fabulous and fascinating. We paralleled it for 175 miles. I had forgotten about the abrupt changes in the landscape, especially following The Dalles, Oregon. Lush forest gave way to stark desert and later returned to a more arid mountain setting. We turned off I-84 in the midst of this second mountain setting. I found this second mountain range to be the dullest scenery of the entire trip. Nothing was around us, just an endless flatness, much like Nebraska had been in my first cross country journey. It seems that this banality created a happy, entertaining side project for Mom and KC and I. We began to read Joanna Macy’s autobiography, “Widening Circles”, aloud in the car while driving along. Both of us had taken strong inspiration from a recent one-day workshop with Joanna. Auspiciously, this event was scheduled for July 24, the day before departing Marin, and Joanna herself seemed particularly pleased to know we were there before traveling when we spoke briefly with her directly. Washington State also brought the first dose of Interstate 90, the longest interstate highway in the USA. I reminded my mom with amusement that we could just continue on 90 and eventually reach Logan Airport – and then go right on home to the North Shore. 90 became a recurring character in the roads of the trip, though not the primary star. On another numeric note, this first sighting took place in the 509 area code; of course Massachusetts knows the 508 area code very well. 90 cut right through Spokane, Washington, a city that is clearly an important regional outpost. I had difficulty discerning a personality to it, and wanted to see Christopher Walken appear somewhere straight out of the Martin McDonaugh “Behanding in Spokane” play. Soon, 90 crossed over the Idaho state line. My mom had forgotten that we were even passing through this state and viewed it as an extra treat. I found this northern “panhandle” area to be an almost complete opposite from the southern, flat Boise region that I’d seen only once in 2006. Especially following the main town of Coeur d’Alane, lush trees dotted the landscape and the road became increasingly mountainous and curvaceous. I felt bemused that I seemed to be on a roll for getting the more treacherous driving segments as I was again at the wheel of the Outback. Eventually 90 wound its way up to Lookout Pass, marking the border between Idaho & Montana AND Pacific & Mountain time. I switched the car clock – I don’t wear a watch – with a feeling of bittersweetness and fullness from a Huckleberry milkshake. The scenery grew grander and grander as we proceeded in to Montana. I quickly came up with a metaphor of the surroundings seeming to be on a bigger scale than elsewhere in the USA. Or it could have been that we’d driven outside of the country to another region entirely. Or to the roof of the country. The allegories could go on and on! I was surprised that the speed limit for local, two lane roads in Montana seemed to be a consistent 70 miles per hour. This helped to make good time as we proceeded north towards Whitefish, passing the impossibly blue Flathead Lake and a series of attractive small towns. We stayed with an old friend of my mom’s living on the outskirts of Whitefish. The historic and compact downtown did not reveal itself until the next day. The kindness of our host, Carolyn, and her son, Arthur, was immediately clear as we enjoyed a late night garden feast. Befitting the northern latitude, the sky did not fully darken for the night until 10:30pm. The PAUSE button was used to its maximum benefit on this day. After catching up on some rest, my mom and I decided to explore the downtown area of Whitefish. I’d originally learned of the town through a local theatre company, the Alpine Theatre Project, and was able to plant a seed for potential future employment while there. Whitefish itself seemed to be more self-consciously trendy than I expected. Well-dressed tourists rubbed shoulders with each other while out of state licensed vehicles, including at least two from Massachusetts, cruised down the main street. For a while I was not sure if we’d be able to visit nearby Glacier National Park, which (in my mind) had been the primary purpose of having an extended stay in the Whitefish area. We proceeded in the direction of the park close to sunset and were rewarded with a truly out of this world experience. Driving 30 miles, about ½ involving snaking around a mountain, up to the Continental Divide. At least two varieties of goats wandering around near the mountain. Departure from Whitefish brought a strong feeling of fulfillment after the majesty of Glacier in the preceding evening. The initial segment of our journey retraced a path along Flathead Lake, and then continued through a mountain range towards Missoula. Out of the entire travels with my mom segment, this was the day when we were most focused on “getting there” (to Powell, Wyoming) – and not so much on the surrounding scenery or attractions. We had also planned to visit a friend of my mom’s in Bozeman, Montana on the way south into Wyoming. Unfortunately, this directive meant that we’d be unable to visit nearby Yellowstone National Park and have to gaze wistfully at the many signs for the Park along our route. I was disappointed, but accepting, and hope to have a future opportunity to see Yellowstone. The sisters kindly prepared two varieties of salads for us to feast on in our break. Of course, the intended one hour visit became two hours, but that did not deter us from getting to Wyoming by nightfall. I was intrigued by the similarities of the northern Wyoming landscape to my previous visit to the state in 2006. Once again, I was driving along a high plateau with a gorgeous sunset in the rear view mirror, an endless basin visible ahead, and an awkward mixture of past (farms) and present (oil companies) industry visible along the road. We’d come into Wyoming to link up with my college friend Nate, who would be joining the trip from this point on through Ann Arbor. I was happy to have him come aboard and to know that he saw us as “rescuing” him from Wyoming, being Northeastern friends and his first and last in-state visitors. This travel day was KC’s least enjoyable one of the trip. She was at her most vocal through the first half of the drive, from Whitefish to Missoula, and did not care for that evening’s accommodation, meowing with displeasure for a large portion of the overnight. DAY 7, JULY 31: Continuing East! I had forgotten that it was Sunday morning until seeing downtown Powell so obviously empty made me remember church services. Nate confirmed that the town is largely traditional and pious. I was intrigued that it shares the same total population – 5,000 – as my hometown of Manchester by-the-Sea, but Powell is spread out over twice the geographic area and none of the coastal breeze. We all enjoyed a take-out breakfast from the local diner/breakfast place/greasy spoon. My mom seemed particularly pleased by their kindly service, as the waitress had taken much interest in our cross country journey and donated forks. I wondered why someone who had parked next to me (I waited in the car) smiled broadly at me until I saw her Oregon license plate. She must have felt a similar fish out of water feeling to be in Wyoming. I did not feel completely uncomfortable there; just noticeably out of place and unsure of what I would say if I interacted with a local resident. Nate took the driving lead as we began our caravan-ing and proceeded out of the Bighorn Basin. This time, Mom was at the helm for a stretch of challenging mountain driving. The road of the day, Route 14A, snaked around the intense Bighorn Mountains up to at least 8,000 feet, and then back down again towards Interstate 90. Near the summit, we decided to stop at the Medicine Wheel, a local Native American monument. Mom was a little too energetic parking the car and knocked my front license plate off the car. If I had not seen it when we returned from the Medicine Wheel, it might still be sitting there. I decided to bring KC along for the longer than expected hike to the wheel site, which continued the social experiment of having her in public settings. To my surprise, the park ranger did not bat an eye when she saw that I had a cat with me and asked that I leave her at the entryway. Perhaps the ranger was more concerned with a rude visitor who had just preceded our arrival and was apparently unwilling to cooperate with movement restrictions and staying on a marked path. This day began a series of GPS-found and memorable lunch stops. We passed through Sheridan, Wyoming, also noticeably quiet on Sunday, but still welcoming in at least one coffee shop! My turkey sandwich – I think it was turkey?! – was among the freshest I’d had in the last several months. This created some satisfaction as we continued on I-90 through several more Wyoming towns, including Gillette, with a final destination of Rapid City, South Dakota. I almost forgot to mention the walkie talkie system that Nate introduced today. Although this was regrettably short lived, it provided for easy non-cellular communication between the two vehicles with some novelty on top. This evening brought the first sizeable dose of Summer Rain on to the trip. We could see a series of ominous looking thunderstorms on the horizon heading into Rapid City. Shortly before we reached the destination, they erupted! This created some of the lowest visibility I have ever experienced, and I was again at the wheel. Thankfully, the hotel was under 5 miles away, and a welcome terminus when we did reach it. Nate and I celebrated with a trip over to Perkins, and I may have downed a milkshake in a record amount of time. This Monday morning brought a clear national/patriotic highlight of our trip in visiting Mount Rushmore. I appreciated the monument much more than I had anticipated, and I think my mom felt the same way. The ride down from Rapid City brought scenery and Las Vegas style flaming decadence in Keystone, but then the curvaceous road returned to spaciousness. Nate had told us that the mountain would suddenly appear from the road – and there it was! I was stunned by the precision of the heads, where they have been there for 80 years and look like they were carved yesterday. I hadn’t intended to pull in to the $11 parking area, but once I did, there was no need to back out; it seemed worth it. Mount Rushmore is also the type of tourist attraction that is better early in the morning before the crowds. We made it there by 9:30am. I wondered if all 50 states might be represented in the parking lot on any given day. I appreciated how the visiting area sought to balance crowd control (a wide, central viewing area with the flags of all 50 states hanging above) with the scale and scope of the surroundings. A long nature trail extended in a loop around the base of the mountain. We took it and were rewarded with multiple non-traditional views of the mountain leading up to a wooded exit back to the parking area. Nate and I had recalculated the driving route for this day into a Capital Tour of the Dakotas, passing through Pierre, SD, and ending up in Bismarck, ND. I might have looked at the driving distances more closely, as the journey became far more epic than we intended. It did still have highlights with the surroundings. Pierre in particular demonstrated precision on the banks of the Missouri River. The city marks the Western border of the Central Time Zone, and the communities across the river are in the Mountain Time Zone. My mom joked that it must be hard to plan social engagements. Pierre must be one of the smallest state capitals in the USA, housing just 14,000 people. It’s also one of five state capitals not directly served by an Interstate highway. The others are in Delaware, Alaska, Nevada and Missouri. I was surprised to notice that Pierre also offered the most extreme heat of our trip. The digital barometer read a whopping 109 degrees, but the lack of humidity made it not feel extremely severe. When we stopped at a local gas station, it marked the start of a brief and confusing trend where mid-grade gasoline was priced cheaper than the regular gasoline. It seemed that ethanol ingredients were the culprit here, though no further explanation was given in a public view. The GPS led us to another winning choice for lunch – though on this day the meal was extra late at 4pm. The “Main Street Grill” offered fresh food and home cooked deserts by the owner, who also doubled as our waitress. She was accommodating of us bringing KC along even though she had an allergy to cats. Thankfully, the restaurant offered seating just outside their main area for patrons in the foyer of the building, which seemed to be a very old downtown hotel. KC was not the first pet visitor of the day. A local man came in near the end of our meal with his forceful-looking pug, who looked like he usually gets what he wants. The four of us must have seemed very out of place in Pierre: Mom with a wraparound sunhat, Nate looking around at the sights, and me carrying KC in her carrier. To prove this point, one family pointed at us and took pictures through the window as we left the restaurant. The next segment of our travels became the most strenuous of the trip. We left Pierre at around 5pm, but did not reach Bismarck, North Dakota until close to midnight. The culprit for this lengthy journey? The setting sun and a closed section of US 83 that we were not aware of until getting close to the affected area. It seemed that the June floods in South Dakota left an extensive mark, requiring at least one stretch of road to be extensively repaired. The detoured route took us west through Mowbridge, an area which the restaurant owner had pooh-poohed earlier in the day. It was easy to see that the region did not have much going for it. To my surprise, crossing the Missouri River again (briefly back into Mountain Time) led us to a landscape more reminiscent of Scotland than middle USA. Rolling green hills sailed down to the banks of the river, and several towns seemed to have appropriate corresponding Scottish influences. Unfortunately, we couldn’t keep pace with the setting sun, and proceeded up to Bismarck on a back road in total darkness, with only a casino en route serving as a sign of civilization. I appreciated the novelty of simply being in North Dakota. I rode that enthusiasm once we eventually reached the hotel, logging online for the first time in what seemed like weeks, but was really only 2 ½ days, and discussing further travel plans with Nate. KC took a liking to this hotel room, and to hotel bedding in general. Throughout the hotel stays, she particularly enjoyed finding a crease in the blankets that she could fit right into to relax and observe our actions. We did not give ourselves much time to see Bismarck, needing to press on to Minneapolis in order for my mom to connect with her friend she would be staying with that night. We did get to quickly drive by the North Dakota state capital building on the way out of town. My Lonely Planet guide book described it as “Stallinesque” and they were not far off the mark. This day became our most focused On The Road day due to the evening commitments. We enjoyed periodic radio communication between the two cars, and ruminations about the surrounding landscape. One stretch of the North Dakota I-94 was very obviously affected by floods yet to fully evaporate. I was surprised to see a train line running right in the middle of a flooded area, and wondered if it is the same line that the Amtrak “Empire Builder” from Chicago to Portland and/or Seattle traverses on a daily basis. Later in western Minnesota, 94 seemed to be loaded with permanent frost heaves nearly all the way to Minneapolis. We did budget time for a lunch stop in Fargo. Nate and I both felt that the initial rural residential feel of the town was highly similar to Amherst, MA. However, that development quickly gave way to a more traditional Middle America shopping mall orientation. We’d hoped that the GPS had led us to another memorable lunch spot, but the intended spot turned out to be a Chinese food buffet. We proceeded inside anyway, even though KC was unable to join us and I was probably more nervous about leaving her in the car than I needed to be. The $7 price was right, with an interesting cross section of patrons and odd preference for Michael Jackson songs on their stereo. A few hours later, we reached the western outskirts of the Twin Cities, made obvious by the increase in traffic and brake lights. The Twin Cities provided the most intense traffic of the trip. I did not mind it, but I was reminded of why I drove out of traffic times as much as possible in the Bay Area. I will remember the provocative moves of public transportation drivers in that area, later confirmed by Nora, our host for the night. One bus driver cut off two lanes of traffic on I-94 in an effort to make his exit. Later, Nate and I experienced Minneapolis cross town traffic. It was a thing where it seems easy and basic once you know the specific route, as I found out the next morning. However, initial unfamiliarity magnifies the confusing nature of being in a new area. We did reach our hosts for the evening and were rewarded with a sushi meal in “Uptown”, one of the trendiest spots in the city. A stop at a nearby gas station revealed another side. A hipster biker was involved in some scuffle, and stood near a police car awkwardly waiting to be released while another man was inside the car angrily addressing the assembled officers. This day marked my mom’s planned exit from the trip, flying ahead home to Delaware to resume her teaching commitments. I saw her off to the airport and felt excited to be continuing on the driving journey. Nate and I also faced the shortest drive of the trip for that day (120 miles due north) and allowed some leisure to permeate the schedule. He found his way to Al’s Restaurant, a famously small diner in Minneapolis, while I spent too much time on the computer catching up on the digital life. Nora, our host, rejoined us for lunch at an upscale local eatery. I chose the “California Wrap” out of dual nostalgia and curiosity. It was heavier on the flavor – turkey and avocado – than most “real” California sandwiches would be. Nora had to partake in some errands, so we traveled with her to a nearby Best Buy. This suburban glimpse did not lead to the Mall of America, just 8 miles east of where we were… but it did lead to Xerxes Avenue, so named as part of Minneapolis’ alpha-numeric street system. The extreme Minnesota heat of the previous day had mostly evaporated by the time we set out for Duluth and Superior around 3:30pm. The traffic for the day had already begun and I quickly found myself in the lead for our caravan but separate from Nate and unable to pull over to wait. It seemed unbelievable that through traffic for north I-35 only received two lanes. But that was the reality and clearly the source of the initial backup. We passed over the bridge site that had collapsed in 2007 (now occupied by a graceful replacement) and continued north through several tight curves as the Twin Cities metropolitan region began to fade. A GasBuddy.com spotted cheap gas station served as reunion point. I could have driven away without paying for gas here, where my card was not initially read at the pump and yet it filled anyway. I only happened to catch the notice of “not read” out of the corner of my eye. Nate took the lead again as we proceeded north towards Duluth and back into heavily forested country. The frost heaves returned as the surroundings became more rural. To combat this development, we switched to a two lane road advertised as “parallel scenic alternative” to get to Duluth. Unfortunately this transition also marked the end of the walkie talkies, when one was inadvertedly left behind at our post highway rest stop, and we did not discover its absence until arriving in Superior. The two lane road became a hypnotic Tunnel of Trees continuing north through many small towns. Several names evoked New England, most clearly in a brief passage through Holyoke. We skirted the edges of Duluth, which seemed to be an appealing city that I would have liked to spend more time in or at least look around. Perhaps another time. I later discovered the city houses two highly progressive theatre companies, one that had recently run a regional premiere of a Neil LaBute piece. Our entry into Wisconsin easily won the award for Most Dramatic State Entrance as we crossed the Blatnik Bridge, a high crossing at least 200 feet above Lake Superior. It was initially confusing to figure out where downtown Superior existed due to various construction projects. Thankfully, Nate’s cheerful friend Dustin came to the rescue and provided us with hospitable and friendly accommodation for the evening. The neighborhood and community oriented life was immediately apparent in Superior. The town itself seemed to be an awkward mashup of time warp, depressed town and shire town for a larger region. We did find an oasis of urbanity in a coffee shop on the way out of town the next morning. DAY 11, AUGUST 4: UP, UP, UP! Today’s route heralded the stretch of scenery I was the most excited about seeing: the Upper Peninsula of Michigan. This region is so far off the typical tourist map that some people half jokingly refer to it as the 51st state of the USA. To reach the “UP”, we first had to traverse the northern frontier of Wisconsin. This became an easy trip along US 2, a route I have come to know in its New England incarnation. Perhaps the most intriguing sight here was an enormous seawall in Ashland, Wisconsin, like something out of Lord of The Rings. I had thought that the crossing into Michigan would bring an immediate switch to Eastern Standard Time, but the border communities are actually in Central Time, to avoid a discontinuity with Wisconsin. We sampled the famous “pasties” (very similar to empanadas or other meat pies) in Ironwood. I enjoyed mine, but I enjoyed the accompanying slice of pumpkin cake even more. There was extensive two lane blacktop driving to be done over the course of this day. The Eastern time zone soon appeared during a rural stretch of road, marked by a very small sign. Looking back on it, I’m surprised I was not more affected by it. I suppose the novelty of being on the UP and the dramatic scenery kept my spirits up. Lake Superior was a near constant presence to the left (north) as we continued east, through the major city of Marquette and many smaller towns. The town of Munising doubles as the southern gateway to the Pictured Rocks National Seashore. At least two friends had recommended we see this park, best known for its white cliffs. It turned out that the cliffs were too far off the beaten path. I did lead the three of us to a scenic and welcoming beach area, Sandy Point, creating KC’s first visit to a beach. Nate joked that she may have thought of it as a giant litter box. I found the water to be warm and the sand to be calming. It would have been easy to stay there for a few hours. But there was still a long distance to go to Sault St. Marie, and by this time I had also discovered one of my headlights had burned out. I did not want to get a traffic ticket while on the road – and luck stayed with me throughout the rest of the journey. It was almost confusing to reach interstate highway (75) for the last eight miles of the journey. After all, the day had covered almost four hundred miles of two lane roads. Sault St. Marie quickly appeared on the road signs, served by only two exits before the interstate crosses into Canada. I was amused by the directness of the Canada-bound signs; one in particular only said “STRAIGHT THRU” rather than “NEXT LEFT” or “KEEP RIGHT”. I had hoped that “Sault” might be the site of a random late movie on the trip. Instead it was a random and late dinner, as Nate and I were directed to the local Applebee’s, the only thing open at 9:30/10pm, and served as some of the last customers of the day. DAY 12, AUGUST 5 – ACROSS THE MACKINAC, DOWN THE PENINSULA, JUST IN TIME FOR A SHOW! The Days Inn in Sault St Marie provided the least satisfying breakfast of the trip, with poorly cooked eggs being the only thing I ate in a very awkwardly designed seating area. Nate got stuck with a crumbly bagel and very small cup of coffee. We set off to see the downtown and hope that there might be more breakfast options. The downtown seemed very hospitable to me, with the emphasis on community very evident as shopkeepers got ready for a street fair that day. The Canadian influence felt clear, too, although not in an immediately physical way. Nate pointed out that it would be a shorter trip to New England to drive from Sault through Ontario and Quebec than down through Detroit, which I had not realized until he mentioned it. We had to stay on schedule in this day, needing to reach Ann Arbor, 325 miles south, by 6pm. As such, we were back on I-75 by 10:30am. For some reason, this day’s drive felt the most hypnotic to me at the time and now in retrospect. I was initially surprised and weary of the long distance, with many signs pointing to Saginaw as over 200 miles south. And yet the time seemed to pass quickly, or I lost track of time, as we proceeded south. My IPOD had run out of battery and I relied on periodic radio station entertainment for this drive, which might have contributed to the disorientation and speed. There was a clear highlight in the journey south over the Mackinac Bridge, linking the Upper and Lower Peninsulas of Michigan. I’d read that the bridge had some structural similarity to the Golden Gate, and indeed I could see the resemblance. It seemed to be a sleeker and greener cousin to the GG, with just four lanes instead of six. I got stuck behind a truck going south, but used some creative sneaky driving techniques to catch up to Nate’s lead by the end of the bridge. The bridge itself is five miles long with a mix of causeway and suspension flair. I was surprised to see that it is referenced as a northern destination point for northbound I-75 until at least 200 miles south of it. The popular perception of Michigan as two separate states was also reinforced when we passed a “state welcome center” just south of the bridge, as if travelers had entered from another state or forgotten where they were. Eventually, we arrived in the hardscrabble town of Flint for a short visit to Nate’s friend and former colleague. For me this was the most jarring stop of the entire trip, as destitute areas co-existed with awkwardly obviously redeveloped downtown stretches. We got a glimpse of the less desirable neighborhoods before stumbling on the downtown. I have never seen a place so clearly re-developed, even featuring cobblestone streets (?) and newly installed arches along the way. I did enjoy the lunch spot choice, a loud and raucous underground-seeming pub clearly inhabited by only locals. One group in particular seemed to be having a grand old time, laughing at the current sports game and talking loudly to each other over their own din. Meanwhile, I stepped into Social Coordinator mode, planning activities for that evening in Ann Arbor, which ultimately developed into a joint opening night cast party and college reunion adding our friend Anna. I was briefly unsure if we’d be able to make it down there – another 50 miles – in time for the show. However, the solution was to “floor it” along US 23 and stay cool. This made all the connections work, dropping off KC at Russ’ house and then continuing over to the nearby West Park Band Shell just in time for opening night of the Penny Seats! As before, staying off the road was considerably more rewarding than I might have anticipated. The exciting premiere weekend of the Penny Seats made the whole weekend sustain a creative and high spirited energy, whether it was walking around and hanging out around downtown A2 with Russ and friends, hanging out as a Penny Seats groupie, seeing the show a second time under initially heavy rain that gave way to mist, experiencing the sign of the times walking around Borders’ soon to close flagship store, and soaking up the youthful and progressive A2 spirit again. I also arranged a side trip to Kalamazoo to visit theatre friend Kristin. While I felt the effort leaving A2 at 8:30am Sunday after a late Saturday night with Penny Seaters, it was worth the effort to catch up with Kristin and see another part of Michigan. This side trip also brought my first view of a Delaware license plate in the entire trip. I closed the zestful weekend in a relaxed way on Monday the 8th, and allowed myself the leisure of waiting until 2pm to head out southbound towards Dayton, Ohio. I was relieved to not be covering a (relatively) huge travel distance when KC and I got back on the road on Monday afternoon. Routes 23 and 75 proved to be an easy way to scoot down into Ohio. I remember being surprised at the smaller distance from Ann Arbor to Ohio (35 miles) than I expected. Then I remembered that each time I had left Ann Arbor in my previous visits, I had done so via Detroit, which adds an extra 50-60 miles. Michigan scenery quickly reverted to a countryside motif before giving way to Toledo suburbs. The city of Toledo itself was invisible on my route, but I got a good look at it last December and January. Dayton proclaimed itself to be “The Crossroads of America” with its junction of interstates 70 and 75. I understood the crossroads motif, but also noticed that many exits were missing signs. My host and local native Chris later explained that 75 is in a semi-regular state of reorganization. I made my way out to the southeastern suburbs and his hometown of Bellbrook. This time, the relief and gratitude came from relaxation. I needed the pause of staying in a house and not being busy more than I expected. A certain amount of spontaneity still made its way into my activities that evening, especially when we decided to visit a local discount cinema. I had thought that $3 movies were a thing of the past… But not in Dayton. In a neat twist, the film we chose (SUPER 8) was set in the Dayton area. I debated whether I wanted to go to a late film, knowing that I would have to head out early the next morning, but am glad to have done so. I recall that I’d wanted to go to a film throughout the cross country trip, so in a way it was good to save the treat to close to the end of the journey. I stayed on a self imposed schedule this morning, leaving the house almost exactly at 9am. I had noticed the day before that Dayton offered the lowest gas prices of the trip ($3.40 per gallon) – but the one closest to the highway was more like $3.60. The higbway extended infinitely, especially as I got onto Interstate 70, which would provide the majority of that day’s two lane blacktops. It was interesting to be on another part of 70, as I have traveresed it in Colorado several times, but never elsewhere. On this trip, a large array of newer highway signs greeted me. This was a trend I had first noticed in Michigan, and upon Googling it, became aware that several states have adapted a new highway sign font: “Clearview”, with intentions to take it national in the future. Discovering the unique geography of West Virginia, when I entered the state at Wheeling, exited it, and then entered it again about an hour later. Visitng my father’s college town of Washington, PA, where he has not visited since 1978. The novelty of seeing West Virginia for the first time from a car. I got a brief glimpse of it from a train last December. Continuing along Interstate 68 through the West Virginia and Maryland panhandles. I had specifcally chosen this route to avoid the $25 toll from taking the PA Turnpike. It seemed to have the most hills of any interstate I have ever been on. For a while, it seemed like that was all there was to the road, as it moved from one 1000-2000 feet high ridge to the next. The surprise of falling back into traffic on Interstate 695, the Baltimore Beltway – I referred to it by the British term of “ring road” later that day. Attempting to avoid the double-toll of exiting Maryland and entering Delaware, and then realizing that would not be possible and getting back onto Interstate 95. The friendly familiarity, and knowledge of being close to home, of getting on 95 again. Bemusement about how quickly the $4 toll booth appears after the Delaware state line. A warm reception by my mom and Richard when I did reach Wilmington, Delaware. Initially I felt over indulged to know that my mom had scheduled an ionic foot bath, massage, facial and pedicure for me to indulge in while laying over in Wilmington. But it worked out well, and I’m sure my internal systems were grateful. The ionic foot bath was particularly unusual, putting my feet into what seemed like a normal foot bath, until the water began to change colors over a thirty minute span. I also got a refresher on Delaware’s status as a sales tax free bonanza as we visited several chain stores. I’m glad to have chosen to buy several theatrical scripts that day at a soon to be closed branch of Borders. The cost for five books was around $40, and would have been $75 if they were up at their listed price. We balanced it out with some family reunion time, eagerly planning our upcoming adventure to the homelands of Martha’s Vineyard. My mom and KC and I re-teamed for this home stretch, but switched base cars into her Subaru Forester. We set off in what felt like a very haphazard manner, almost saying “oh, right, we have to travel today!”. I was relieved that the New Jersey Turnpike had little traffic, and felt impressed that the Garden State Parkway was similarly expedient. We sampled Ravenna Michalsen’s album of dharma songs, followed by music from the Secret Garden taking us in to New York state. For some reason, it has taken a long time to determine an ideal route to travel to my uncle (my mom’s brother) and aunt’s house from Delaware. After this trip, I think we have it. The primary NY route involved Route 22, which winds its way out of Westchester County and into familiar lower Upstate rolling hills. Spontaneity invited us to make a brief visit to an ice cream parlor in Putnam. Their prices were a far cry from the Fairfax Scoop, my local Marin County ice cream parlor of choice, and so I moderated the purchases for that visit. We continued north and I felt a comfortable anticipatory feeling as the New England border neared. By Millerton, New York, this feeling escalated to one of genuine excitement, and I initiated a high five as we crossed into Connecticut. My mom was amused by the officialness of my remarks, as she may have considered the non metro NYC areas of New York to be suitably evocative of New England. But now we were really back in the homelands. The familiarity and close-knit community was immediately evident passing through Salisbury, CT, and on up the hill to the Salisbury School. Our arrival was well timed – two of my three cousins (of that branch) arrived back home a few minutes after us, and their grandmother, whom I may not have seen since 2002, was also making a short visit to the house. I was pleased with the choice of activities for the evening, taking us all down to a lake on the Salisbury campus to enjoy catching up and the evocative scenery. I recalled with pleasure that visiting this branch of the family had marked the Return to New England on my first cross country trip, the Departure from New England on my second, and was now once again serving as the Return to New England. DAY 19, August 12: Massachusetts! Our travel schedule coincided with the Return of my cousin Leighton, and I was pleased to be able to stay a little longer into Friday morning, just long enough to welcome him back and take a few Family Photo Op reunion pictures. My mom and KC and I continued on our way into Massachusetts. I had forgotten that the border between Canaan, CT, and Sheffield, MA offers no official “Massachusetts Welcomes You” sign, but was grateful enough to see the familiar MA storybook-style town line sign. Many memories of previous Berkshires region visits – and my longer time in nearby Chester in 2007 – washed over me as we continued north along Route 7. Great Barrington did not seem to have changed at all, though some differences were visible in Stockbridge and Lee. I arranged a Mass Pike radial rendezvous with long time friend Elizabeth so that Mom could continue on to her Ayurveda conference and we could go on to Worcester. Again, for me, the switch out of family and into friend mode meant that I could exhale a deep breath. I made sure to get KC comfortable with the surroundings of Worcester, where she would be spending the next week in that apartment. At the same time, I rolled with the punches of what Elizabeth and her brother Kevin chose to do, which ultimately revolved around a lot of Indian food for that evening. This day won the award for most self-consciously slow day of the trip. I had the choice of going back to my home region of the North Shore with Elizabeth and her brother, but elected to stay in Worcester instead, partially because of wanting a breather from the travel and partially wanting to keep KC company so that she was not alone in an unfamiliar environment. I ended up spending most of the day writing this essay, and though it was long, I’m sure that I will be grateful to have done it in the long run. I also recall the awkwardness of exploring an unfamiliar Worcester neighborhood when I ventured outside to purchase a personal pizza for lunch. DAY 21, AUGUST 14 (FINALE) – ON TO MARTHA’S VINEYARD! A humid rain could not damper my anticipation of traveling from Worcester all the way back to my family homeland of Martha’s Vineyard. In a fortunate coincidence, Elizabeth’s landlord was traveling in to Boston that morning, so I rode with him as far as Newton and cracked many jokes about my home state. I should add that the novelty of being back in MA was starting to wear off by this point, just as Richard had predicted. I enjoyed a long-overdue reunion with childhood friend Matt in Newton. I wished it could have been for a longer period of time, but am sure there will be other opportunities in the future. I chose a local Starbucks as a reunion spot, but was beginning to grow tired of the chain, which I had been patronizing more frequently after receiving a birthday gift card. I’ve finally finished the card as of today, August 30. My mom and Richard arrived late to the rendezvous, causing us to then speed right along down routes 128 and 24 towards Martha’s Vineyard. There was some debate about whether we wanted to rush on to the next available ferry or proceed with the previously scheduled reservation of 7:45pm. Once we reached Woods Hole around 2:45pm, it became clear that the reservation could not be changed. To my veteran eyes, it seemed that the Vineyard had more auto and foot traffic than any time I had been there in the last 10 years. Of course, that’s great for the Island… and a headache for travelers. We upped the ante on our travel-hardiness and visited the nearby Fishmonger Cafe in Woods Hole village. The rain had not gone away by this point, but the sea breeze remained refreshingly fresh. It was mutually decided that I would go ahead as a passenger in order to set up my tent at the campground and then go on to Mr. Ben Taylor’s annual concert at the Whaling Church in Edgartown. I liked this option and felt that it would be a fitting finale to make the ferry crossing as a solo journey. I boarded the ridiculously large ISLAND HOME ferry at 3:45pm. The boat stuck to schedule and cruised right out on to Vineyard Sound while the tourists mingled and read up on the Island. I felt a natural unity and right place, right time standing there on the front exterior deck. As the Vineyard began to come into view, West Chop first as always, I knew I’d come home again. Detroit’s Hilberry Theatre, where I’m currently spending quite a bit of time, will complete its season opening run of Boeing Boeing this weekend. Their stage won’t be dark for very long as Romeo and Juliet waits in the wings to open three weeks from now. So before Boeing flies away to another destination, I wanted to offer a few words of appreciation towards this particular production. I also forgot that I wrote a similarly reflective post after the second time I saw the show. Of the now four times I’ve seen this show presented – in London, Walnut Creek, Wilmington and now here – this was the most humane version I’ve seen. None of the other productions gave me a sense of what the characters might be like offstage or what their wider story is like. None of the other productions suggested the complications of the air hostesses’ lives as they navigated their complex timetables and globe trotting jobs. Granted, it’s unclear how much my knowing the actors and actresses might be playing into my impressions here, and how much the audience is intended to identify with each character — that latter detail is always a role of the dice — but the attention to character detail seems particularly notable in this Hilberry production. Not to forget that this version also changes the gender of a major character, with satisfying and memorable results. So I’m sure that the show will ride off into the sunset on the jet stream of appreciation, and here’s hoping it has a cruising final quartet of performances up to Saturday evening. William Shatner does not need to keep boldly going at age 80, almost 81. And yet, like any good actor, he keeps saying yes, or may be afraid of stopping, or he may just want to work as long as he can. Or some combination of those three factors. In any case, his latest career turn has taken him back to the theatre, where he got his start but has not spent time for quite awhile. So he turned to a knowledgeable and easy to remember subject: himself. He brought his latest enterprise to Philadelphia for one night only on Tuesday, March 13th. With celebrity autobiography shows like this, it can be hard to pick out the drama. Well, their life’s drama is often splattered around the stage, but the dramatic throughline of their presentation can be harder to discern. I thought back to my seeing Carrie Fisher’s “Wishful Drinking” four years ago in Berkeley, and how I’d let myself get wrapped up in her forcefully glamorous aura before being reminded by my also in the audience friend to think critically about Fisher’s presentation. The same challenges exist in Mr. Shatner’s performance, and yet he has become so iconic (treasured?!) that I’m sure a good chunk of his Philadelphia audience took pleasure in simply seeing him LIVE. He did enter and leave the stage to a standing ovation, the latter round of which I joined in on. He takes the audience on a merry-go-round of a live autobiography, from the streets of Montreal to the hustle of Los Angeles to the infinity of outer space, and beyond. His most famous credit gets its due, but is not as closely scrutinized as I’d expected it to be. Shatner offers hints of what seems to be a larger theme of achieving personal (serious) acceptance of the role, something I would have liked to hear more about but may be difficult to describe in a public setting. He doesn’t shy away from describing other parts of his career, but does keep the focus about 90% on his public life. His three daughters are only mentioned briefly, perhaps by their request, and there is no examination of the challenges of maintaining an acting career over so many years. Shatner gave several unscripted asides to the audience about a range of topics from lighting cues to the eternal question of mortality. I found those thoughts to be more intriguing than the scripted material, and can understand why he’s gained popularity for his open mic and written word skills. I’m certainly glad to have attended this performance, and realize that it adds to a relatively wide spectrum of Star Trek actors I’ve either seen or met in person – Shatner, Nimoy, Stewart, Spiner, plus two instances of one degree of separation links to Colm Meaney and Marina Sirtis. And yet, in keeping with my theatrical sensibilities and desire for human insight, I know I might have even more enjoyed being a fly on the wall (or assistant director!) in the rehearsal room for this project. What must it be like to be so closely associated with a persona and therefore make your public life in conjunction with that role? Us it possible to show another side of yourself? How do those close to you feel about that side of your life? Or do they feel fortunate that they know you in real life? Do fantasy and reality blur to an inescapable nebula? From what I gather, it seems that Shatner DOES ask some of those questions in his recent documentary “The Captains”, interviewing all five additional captain-actors of STAR TREK about their personal and professional lives. I considered buying a copy of this film at the souvenir table, but changed my mind after seeing it can be purchased for $12 less online. It is clear you are a role model and still very present figure, Mr. Shatner. Thanks for your commitment and perseverance! In order to move forward and regain some momentum with this blog, I thought it would be helpful to recap the shows I’ve seen thus far this year. I feel like it should be more than 10, though that is probably a case of wanting to see more shows than I actually have. >>EDIT: Oh, yes, it is more than 10. Just. I had a very enjoyable double header of theatrical outings right in my backyard on Thursday and Friday night, but might have waited a little too long to write about them. It is interesting to notice how the energy wanes after seeing the show, although the positive impression lingers. What I may mean to say is that writing about the experience now feels more like a chore or task to do, as opposed to the riding of enthusiasm and creativity in that post-show mood. Thursday evening brought a visit to the Bootless Artworks Theatre Company for their production of Dead Man’s Cell Phone by Sarah Ruhl. This was (at least) the fourth opportunity I’d had to see this play, and it was worth the wait even after reading the full script last fall. It was a pleasure to see storefront theatre in action, too, strongly reminiscent of my old friends at AlterTheater in San Rafael. Emphasis was placed on evocation rather than realism, and I felt that worked well in the context of the play alongside some subtle lighting cues. It seemed that some of the acting styles of the ensemble clashed a bit, but the cast did individually work well with each other to tell the story and move the play along. Friday brought a return visit to the Delaware Theatre Company for their Regional Premiere of Time Stands Still, enjoying its first outside of NYC production following a successful run with Laura Linney in the lead role. This version has vaulted to the top of my shows seen for this year, and I’ll be curious to see if it lingers. The production offered a stunning natural realism shared by the actors, designers, and director. A spacious and evocative set led the viewer into the lives of Sarah and James, connected journalists based in NYC but with their hearts and minds elsewhere in the world. Their longtime friend Richard and his new lady-friend Mandy occasionally dropped by to see how things are going. As the play begins, Sarah has been injured while photographing a (un-named) war torn country oversees. It’s clear this predicament has troubled James, but their path from there is anything but what I expected it to be. As I said above, the specificity was admirable throughout the show, whether having rain appear in the back of the stage, real food being cooked in a kitchen area, and other natural-seeming loft decor. The one distraction for me involved a television running on one side of the stage while crucial character development occurred on the other. My eyes were drawn to the novelty of the TV, but in doing so, I missed the initiation of a plot thread. It was interesting to notice that the story continued during the scene transitions, with the actors functioning as their own in-character run crew while using a gracious and considerate level of body language. Since this was a co-production, it will now move to the Act II Playhouse up in Ambler, Pennsylvania. I’m pleased to know that more audiences will have a chance to visit this distinguished work. Shows to See! January into February! It’s time for another round of SHOWS TO SEE, for planning, organizational, and chronicling purposes. In my recently posted “Best of 2011” blog entry, which was quite enjoyable to compile and explore, I notice that nearly every play on the list benefited from my knowing some additional context or background information about the production. In those cases, it could have been (was) related to the reputation of the producing theatre, newness of the company, intent of the artistic director or some production team member, and in one bittersweet case, the impending closure of the theatre company. I know that my impressions of all of those shows would have been modestly to strongly different if I had not known additional context about the material or company itself. This realization led me to wonder – how much does context play into impressions of the play for the average theatregoer? I’m sure that studies have been done on this issue in some form or another, but the process could be different or unique depending on the geography, location or association of the theatre itself. I’m closing out 2011 having seen 55 theatrical productions, traveled at least 7,000 miles, completed a masters degree, moved back to the East Coast, and with a multitude of additional memories to associate with the year. For this entry I’ll focus on those theatrical memories. I made a top 10 list for the year several weeks ago, expecting that it might be modified before December 31 arrived. As it turned out, that list has remained mostly the same. I also compiled an accompanying Bottom 5 list, but decided not to share that publicly. However, making a list like that reminds me of one of my most interesting theatrical discussions of the year – whether someone receives feedback or not on a performance, and how that process is approached. Perhaps that’s a topic for a future entry. While this show actually opened and ran in 2010, I didn’t see it until its final performance on January 2, 2011, and thus will count it in the tally for this year. A powerful story about cross-generational family ties lingers in my mind alongside a historical issue I’d not been familiar with. I felt that the culmination energy of the closing performance added to the intensity and meaning of my seeing the show, alongside the pleasure of cheering on a friend featured in the cast and meeting the other cast members through him. A breath of fresh air for the normally quite static ACT, this show burst out of left field to become a New Year’s hit. I was captivated by the topicality and breexiness of the script, which knowingly looked at hot-button racial issues without taking itself too seriously. On a related level, the actors and director all worked in a seemingly relaxed manner, letting down some of the artifice or distance between them and the audience to create a lasting theatrical impression. The final production at “The Rep”, which closed its doors immediately following this show’s run, was elegiac with integrity. I’m sure that my knowledge of the theatre’s real life situation added to my impressions of the drama. At the same time, I recall a certain timeless quality to the production, as if the characters were stepping out of time to give us a moment of their time, and then proceeding to move on to another world, dimension or era. This new work took a look at another hot-button issue (gay marriage) and humanized the experience. Prolific Bay Area director Jon Tracy helmed a locally rooted story about marriage equality, and added creative touches in musical numbers and a balanced, large cast to make the narrative involving and emotionally satisfying. The spirit of new plays, where anything can happen and story elements are in flux, was visible in the creative process and risk taking demonstrated by the cast. In writing up this show, I referred to it as an “elaborate jigsaw puzzle” and while that impression still stands, six months later (now) I recall the heightened artistry of this production: the best use of MTC’s stage that I had ever seen, with the set opening on itself twice, the exaggerated yet sharp characterizations – especially Mark Anderson Phillips as the Butler, and the utter dedication of the five person cast. Director Jasson Minnidakis had clearly wanted to work on this play for a long while, and I hope he looks back on it with a sense of fulfillment. Renowned actress and storyteller Anna Deavere Smith returned to the Bay Area to tell this story as part of a national tour. Despite (or no matter of) these wide ranging roots, the show had an urgency and topicality that would put it at the top of my top 10 list – if I chose to organize this list that way. Smith made me forget all about her as she embodied a series of subjects/interviewees and recounted their experiences with health care. A show like this ought to have been mandatory viewing when the universal health care question engulfed the USA. A striking, haunting story was given additional depth by director Susannah Martin and the talented two-hander team of Patrick Russell and Liz Sklar. Themes of supernaturalism and unpredictability ran through the piece, but (more strikingly) ran right alongside emotional realism, seen in Russell’s increasingly urgent, vibrant portrayal of the male lead and a series of videos and audio clips that furthered the character’s relationships – and audience understanding. Another breath of fresh air in the height of the summer, mixed now (in hindsight) with the Culmination/Crescendo of my Bay Area life that came to a close 10 days after seeing this show. The creators took a novel concept – turning the words of the Bard into a rock musical – and added unexpected humanity and honesty to the tale. An equal accomplishment was creating several tuneful, memorable songs that I wish were available on a soundtrack album! Buoyant creativity and gleeful mirth sailed through this premiere production from The Penny Seats. This was another example of outside knowledge (being in attendance on Opening Night of the troupe’s Premiere Production) played in to my audience experience. That awareness was matched by a crackerjack acting and production team game for anything – even a rainstorm on the second night that did NOT deter the performance – and a tongue in cheek script mixing notable drama and cheerful irreverence in such a way that allowed The Penny Seats to make a memorable debut. I’ll dare to say this show was a Revelatory debut experience for the UD/PTTP troupe. I went in expecting to be like “wow” at the end of the show, and I left feeling like “WOAH.” This production was the most skillfully dramatic of the year, as I recall feeling a mix of intensity and gleefulness from getting so involved in the dramatic storyline. The production team also pulled off the coup of making an older storyline seem fresh, which is not always successful. The production notes seemed to imply that the title had been a last-minute choice for production, but the professionalism and integrity of the product belied no evidence of any backstage debates. In a similar manner to the PTTP debut, this production was impressive and deceptively simple. I recall my mom’s comment following the show: “I would have easily driven to Philadelphia for a show like that” and know that I agree with her, where the skillful cast approached Sondheim’s story and score with focus and determination. Several performances from younger professionals showed much promise for future roles, while the veteran performers took a nuanced approach to their work and seemed to intuitively know why they were there and how they’d best fit into the tapestry of the story. On a slightly melancholic note, I could not have anticipated how departing the Bay Area would result in such a steep drop in my theatregoing: 45 shows up until the end of July (leaving the Bay Area), and only 10 shows during the rest of the year. I sincerely hope that the new year will bring the return of more consistency to my theatre-going, now based in the Mid Atlantic Region… and an accompanying production gig would be the icing on the cake. My theatrical year came to a festive though slightly underwhelming end when I attended the “Celtic Christmas” touring show at the Grand Opera House in Wilmington on December 18th. This page describes the tour. I most enjoyed the chance to experience the Grand Opera House in Wilmington, a storied venue that invites patrons in off Market Street, and could clearly serve as a destination for downtown, if/when the city chose to put more effort into its revitalization. They’re getting there, but they still have a ways to go. This is another example of “If I’d written this entry earlier, I might have written more” – and I’ll keep that in mind. Thursday evening brought an introduction to the City Theater Company for their production of A Little Night Music. As show #54, this may win my year-end award for “most pleasing surprise” of my theatrical pursuits this year. I walked in expecting a modest production in a black box theatre space, and I (and other audience members, I hope) received a robust and well tuned fully realized stage interpretation. I was glad to not be overly familiar with the play, though the song Send in the Clowns has become deservedly iconic. From their production history, it seems that this company takes pleasure in interpreting Stephen Sondheim. Previously, they have featured Into the Woods, Company, and possibly at least two other shows by him. I wouldn’t say that the shows were/are a vanity project, as the energy and focus of the cast exuded professionalism. I was quite taken by the bouncy costumes of the ensemble, changing to fit the different moods of the two acts. However, I agree with a local reviewer who felt that the costumes might have been too modern; I didn’t get a good sense of the time period the creators intended to evoke. On a technical note, the visible presence of the orchestra (off to the stage right side of the main characters) was pleasant, but also distracting at times to see the conductor’s hand raise up a few moments before a song began – as opposed to letting the actor guide the audience into the song. I certainly know these things can’t be perfect in a black box setting, and am merely noting it from the audience experience. A well trained and evenly balanced cast gave unexpected depth to the storyline. In contrast to my recent experience comparing Delaware’s All My Sons cast to their Broadway cousins, this time I was relieved and impressed by the naturalism of Karen Murdock in the central role of Desiree. The part doesn’t need to be played by someone with the glamour of Catherine Zeta Jones, and if it’s not, I would say it’s more believable. In looking at the production history, I’m reminded that Judi Dench played Desiree (when Dench herself was in her early 60’s) in a 1995 London production. And it’s interesting to see that Diana Rigg was featured in the supporting role of Charlotte in the 1977 film version, which I’d like to see! While reviewing the production history, I notice a coincidence. The most recent Broadway revival (November, 2009 – January, 2011) had in fact originated at the Menier Chocolate Factory in London, a notable Fringe theatre that opened during my first stint of living in London in the fall of 2004. While I regrettably never saw a show at the Menier, this theatre-going experience (Thursday night in Wilmington) strongly reminded me of their aesthetic, location and production ethos: putting on a deceptively simple production of a usually elaborate show, in a small venue that might be known for something else, close to an elevated railroad and near the banks of a river. So, is Wilmington on the way to becoming an American London? !